Raja Man Singh built Amer Palace in 16th century. It is a mesmerizing blend of Hindu and Mughal architecture. Rajputs made use of this Amber Fort from the 16th century up to the foundation of Jaipur in 1727. 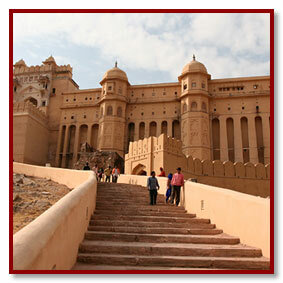 The Amber Fort was used by the Rajputs both for defense purpose as well as the residential purposes. Thus within its mighty walls, one finds charming gardens and magnificent palaces made from marble and precious stones, richly decorated with intricate stonemason works and paintings, which represented royal splendor and luxury. Situated at Jaipur, the reflection of Amber Fort in the lake below looks almost divine. It is not at all surprising to know that this majestic and stately fort was once the Capital of Minas. Amer Fort houses Jai Mandir, a famous temple which has Sheesh Mahal, a beautiful hall of mirrors that are so artistically set that even a tiny ray of light gets reflected in the mirrors and illumines the hall dazzlingly. Sheesh Mahal is famous all over the world as one of the most desirable tourist attraction. Other places of interest in this fort are Sukh Niwasand Ganesh Pole. Although amber fort is open for 7 days a week. But as you know it is situated in Jaipur and in summer temperture is too much and is not a good idea to visit amber fort yet in morning or evening still you can enjoy visit and elephant safari. It is advisable to visit jaipur and its attractions in the month of September to March when weather is more pleasant.